A 48-year-old man presented to the emergency room with sudden onset of shortness of breath and a history of pulmonary hypertension on echo. Patient was unable to undergo a CT of the chest with contrast due to contrast allergy. Ventilation images were obtained in multiple projections following preparation of 30 mCi of Tc 99m stannous DTPA (diethylene triamine pentaacetic acid) by nebulizer. Perfusion images were obtained in multiple projections following intravenous administration of 2.1 mCi Tc 99m MAA (macroaggregated albumin). The dose of MAA was reduced by 50% in view of the known pulmonary hypertension. 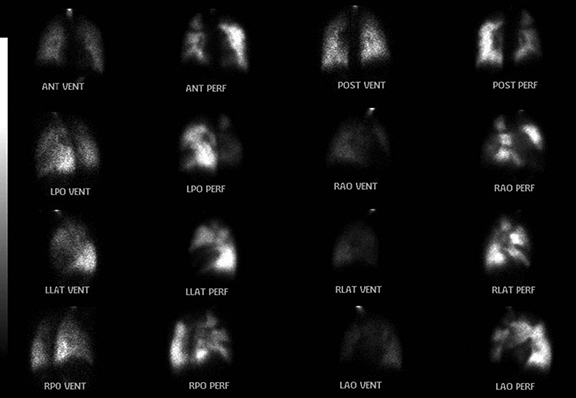 Images show multiple mismatched segmental perfusion defects. These include the anterior and posterior segments of the right upper lobe, lateral segment of the right middle lobe, and superior and lateral basal segments of the right lower lobe. There is also globally reduced perfusion in the entire right lung relative to the left which is not matched on ventilation images. A few sub-segmental areas of ventilation/perfusion mismatch are noted in the left lung, including the apico-posterior segment of the left upper lobe and superior segment of the left lower lobe. These findings are consistent with a high probability for acute pulmonary embolism, since there are two or more large mismatched segmental defects, as well as globally reduced perfusion in the entire right lung relative to the left. Chengazi VU. AT the Viewbox: High Probability for Pulmonary Embolism on VQ Scan. J Am Osteopath Coll Radiol. 2014;3(4):35. Dr. Chengazi is with the Department of Radiology, University of Rochester Medical Center, Rochester, NY.